But my MFA was different! I begin with a true story: I once wrote two versions of a post, placing one on one social media and another on another. The posts were identical in their valuation of Creative Writing MFA programs as useful to some writers but not others. One post, however, concluded that MFAs were not for everyone and only particular kinds of writers would be able to appreciate them. It framed an MFA as something that only an elite cadre of writers could truly handle. MFA graduates LOVED this post and took the time to tell me how insightful it was. The other post, identical in every other way, said that MFAs were not a good decision for most writers. It framed an MFA as something not every writer would actually want. MFA graduates HATED this post and took the time to tell me how wrong it was. With the exception of "write every day," my feelings on MFAs gets me the most antipodean feedback. ("You are so right/wrong! I want to shake your hand/punch you in the face. Please have my babies/fall down an elevator shaft....onto some bullets.") Even the spate of cheers and jeers that starts rolling in around August or in response to my Nano caution can't compete with the ongoing attrition people seem fit to visit on me because I've dared approach the question of MFA programs with some nuance. She seemed to understand the morass of intense feelings that she was about to slog into and asked her questions carefully. I did the best I could to not represent myself as anti-MFA so much as anti-"I-don't-know-what-to-do-next-and-I'm-not-a-famous-novelist-so-I-guess-I'll-get-an-MFA," which is far more accurate. But it reminds me of so many of the comments and conversations I've had about that article, as well as several follow-up posts. People like to skim the bullet points, file everything under a "good" or "bad" column, ignore nuance (or miss it because it wasn't in the bullet points), and then fire off nasty responses. I'm not sure if they quite realize that I can totally tell. I mean...I'm an English major and an English teacher. One of my superpowers is knowing when someone hasn't really done the reading. Nobody likes to think maybe they turned left when they should have turned right or that a decision they made wasn't the best. And while I'm not sure why everyone wants their decision to be a one-size-fits-all BEST CHOICE EVER FOR ANYONE EVER, they do seem to get defensive if anyone impugns them. The problem is that we all want to be special snowflakes, unless it involves other people not wanting what we have. Then you can take that special snowflake and shove it into the oven. It doesn't count if we go our own way for our own reasons. We have to go our own way and be envied by people realizing the folly of not being us. MFAs not being for everyone is okay as long as it's in an elitist way, not a pragmatic one. Clearly you don't understand why anyone would get an MFA. Clearly you didn't make it to the end of the article before hitting reply. You should try that in the future. Seriously, it's right there. I love literary writing. I'm a poet. Then you probably will enjoy the number two reason I gave for getting an MFA. You did make it all the way to the end, right? These aren't good reasons not to do something. I want/wanted to get an MFA! Yes, why on Earth would warning of some pros and cons to spending three years and $30,000 getting a degree with limited pragmatic applications be something anyone does? What WAS I thinking? Look, if you really want/wanted to get an MFA, and you bothered to read the article, then you already know, you're not really my target audience. You are mentioned explicitly in the last few paragraphs. Do what you burn to do. That's the best any of us will ever get from art. I got a lot of value out of my MFA! Awesome! I hope it was equal to the value of the time and money you put in because that is the point I've made only about half a billion times. If the corner drug store were giving out MFAs for five bucks, I would have no end of good things to say about them. If MFAs were free and could be done through correspondence courses on the weekends, I would probably be one of their biggest cheerleaders. If MFAs were the vital first step in a career as a published author, I would be the first to let you know that it's just part of the cost of doing business. For most people, with the kind of writing they really want to do, just sitting down to do some hard work would save them a lot of money and three years of navigating pedagogy that might be antithetical to their writing. I wouldn't have written my novel if it weren't for my MFA. That sounds like a real problem. I hope you cultivate the discipline to sit down and write on your own because when your MFA is over, you can't just go get another one. Eventually you have to write those novels on your own. What I learned was worth more than what I paid. Was it? I mean, really, was it? Look, dewd, this isn't medical school. The ROI on a Creative Writing Master of Fine Arts is the worst of any advanced degree. Let me make sure you understood that. Someone ranked advanced degrees according to which ones got you back their cost in terms of the skills you would learn and employ to make money and the Creative Writing MFA came in....dead last. In addition, a lot of people have a real ideological problem with going into debt to "study" bourgeois art. The professorships look suspiciously like a ponzi scheme (and even if they're not exactly so, that comparison is so accurate it is chilling), and published, successful authors (with only a few exceptions) declare MFAs important to their journey to be a writer. Many of the things MFAs actually teach can be replicated with an internet connection and some dedicated time. X part of my program isn't like you describe. There are hundreds of MFA programs in the U.S. I'd be more surprised if they were all alike. Some have better guest programs. Some explicitly like genre fiction. Some have worked very, very hard to incorporate non white, non male, non cis, non het, non upper middle class voices (and some have even had some success). I hear there's one that doesn't allow boxed wine at their literary events. (Unconfirmed.) My generalizations are based on reading what HUNDREDS of MFA graduates write about their experiences when I was finishing up my undergrad and deciding what I was going to do next. Such an overview necessitates some generalizations. Most MFAs are funded. They pay you. This statement is accuracy-challenged. It's not that these programs don't exist--the accuracy-challenged word was "most." A few prestigious programs may be able to pay your tuition and offer you a small stipend if you teach undergrads, but this work won't be idyllic cloud watching, and funded programs amount to a small number of prestigious MFA programs. Most you pay for unless you're in the top couple of percentile. Just like every other graduate degree. It's not going to hurt your resume. A lot of things "won't hurt" your resume. I know a guy who still puts winning a hot dog eating contest on his just to prove he's a jocular spirit. No one has ever told him hot dog lovers weren't welcome or that the inappropriateness of that accolade cost him the job. On the other hand, it has also never been the deciding factor in getting him a job. ("Well, we have someone better qualified, but they look like a stick-in-the-mud, and frankly, I'd sort of love to see you working hundreds of meaty phallic symbols...not that you need to head to H.R. after this conversation or anything...okay?") We actually rate the value of most three-year programs that cost as much as the downpayment on a house (outside a major city) not by their inability to cause harm, but by their PROACTIVE ability to be helpful. It's wild and radical, I know, but most people don't have the privilege of spending that kind of time and money on something that "couldn't hurt." MFAs are absolutely vital in performing arts. Um.... You're right. Performing arts are very different from creative writing. You look through a playbill at a professional theater and the question won't be IF someone has an MFA in music or dance, but rather where it's from. However, those programs offer years of intense practice and training that hone voice and dance skills (and have a horrific hazing and attrition rate) which Creative Writing MFAs, outside of the most prestigious programs, notoriously lack. Hey, I met agents in my program. Sure you did. So did I. But those agents weren't there to meet you. They were there to meet all of you. They were there as part of the curriculum. They probably paneled a talk for dozens (maybe hundreds?) of students, maybe glanced at a couple of pages of your writing and gave you some quick advice along with dozens of others. Maybe you got a card. Meeting an agent is really not that difficult, but you still have to impress them with your writing if you want to be taken on. That's no different than someone who isn't in an MFA program. They won't be excited to meet you or keeping a close eye on you unless you're in one of the country's top programs. MFAs don't cost $20,000. They're much more affordable than you claim. You're right–well, no, you're not. You're actually dead wrong. But the first half of what you said is right. The current average is closer to $30,000 actually (costhelper.com), and that is JUST textbooks and tuition. The price goes up if you have to take time off of work or fold things like rent and food. So unless you have a very hospitable friend or family member an easy walk from campus, increase that. I was lowballing it when I wrote that article. Thanks for the push to verify my numbers. As I mentioned above, there are a few fully funded programs (some even with teaching opportunities or stipends), but these are incredibly rare and fiercely competitive. Fewer than five percent of applicants are accepted. I will cross my everything for you if that's your play, but claiming that's a good reason not to consider the cost before you make the choice would be.....not entirely wise. Remember, I don't think MFAs are a bad choice if that's what you want to do; I think they are a bad choice if you can't think of any other next step. But if you have the drive and the will and the determination you'll be leagues ahead of all the others who aren't sure what to do next. My program wasn't so limited/focused/experimental. Understand that the article you're replying to is now pushing three-years old, and it was hardly the first piece of criticism to land about MFA programs at the time it was written. MFA programs have absolutely TANKED in the last decade partially because the extended recession means that fewer people can afford to run off and blow thirty grand, but partially because those writers who go through them and publish have said that they did almost nothing to help in the process of being a published author. Some programs have really taken an introspective look at themselves and adjusted their pedagogy. Most have not. I'm glad you found one that isn't quagmired. Really. I can't write an article about every program in the English speaking world without making a few broad brushstrokes, and finding the few programs that have/do what you want is absolutely worth the research time if you're driven. Not every MFA is going to have the same limited voices. This is a bigger problem than you seem to think. Even academia itself has noticed this issue. It is a mark of extraordinary financial privilege to be able to spend $30,000+ on an education that almost prides itself on a lack of a marketable skill (or of other kinds of privilege to be able to write at the level that can make you competitive for a full ride program before you even start the MFA). The overwhelming majority of MFA populations are upper middle class and white, and even when the students aren't, they are being shepherded by instructors who are. And even when they're not, they've been trained on pedagogy that is based on that. Don't believe me? Most programs put their faculty profiles online these days and you can check out MFA program's instructors. Like this one here. Notice anything? Why do you hate on MFAs. You seem to like good writing. I don't hate MFA programs; I have some nuanced problems with them being framed as all good. Mostly I think they are a dreadful decision for a writer who just wants to be a working novelist. It's not because they have no value or can't help anyone write better. It is because, for the vast majority of writers, they are undertaken for quite the wrong reasons--usually reasons that would be better served by simply writing. And unless someone is going to make $30,000 from creative writing (very unlikely), they usually aren't "worth it." And if they're not "worth it," you better get some pretty spectacular intrinsic value. Or drink a WHOLE lot of that free wine. 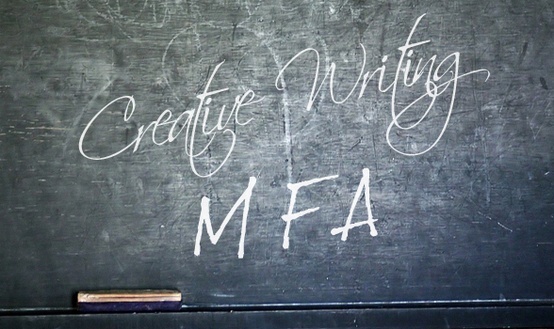 Keep in mind that MFA programs are a pretty new phenomenon. They are only a couple of generations old and exploded mostly to fulfill a demand for a niche. With the exception of a few authors and works (notably Raymond Carver coming from the Iowa Writers Workshop), most of the canon–that's literature and "good writing"–has been crafted without the benefit of any MFA programs. Most of the good writing from other cultures is likewise crafted without the benefit of MFA programs. MFAs don't necessarily produce good writing. They produce literary writing. Literary fiction is a genre of its own. It is largely produced gatekeepered, and praised by a particular aesthetic of both form and content. I like literary fiction, but I have never confused its style for an automatic claim to quality and neither should anybody contemplating a Master of Fine Arts in Creative Writing. This is Marta. Long time reader; first time commenter. I had been considering enrolling in a part-time distance-learning master's in creative writing (whichever came cheaper and more prestigious -- I think this is probably an oxymoron). Your series of posts on the subject have been very enlightening and have shown me that perhaps my reasons were not the best, so I wanted to thank you. My other reason was acquiring a foundation in the craft of writing to have a clear idea of how all the concepts -- plot, character, theme, etc -- interlink and make up the final text. This clear view is a very valuable skill for a copy-editor. But your posts made me realise two things: My heart lies with fantasy and science fiction and I would probably have a hard time fitting in the scaffolding of literary fiction; and I don't need a master's degree to acquire solid fundamental knowledge of the crafts of writing and editing; there are a myriad other sources out there to guide me, and there is nothing like writing to learn about writing. So, thank you again. If I could make a request, I would like to hear from you what non-academic sources have been the most useful for your training as a writer. What you read or did outside of your MA to develop your craft. It might be a useful, constructive follow-up to your posts about creative writing in academia and I'm sure many of your readers would be very interested. If you have already written such a post and I have missed it (you write so much that it's hard to keep track), I'd appreciate a link! Thank you so so much. It's really nice to hear the good stuff once in a while. I'm working to do FAR more reviews and such (of things like books and apps and maybe even non-academic writing programs), so your request may come to be.